Update: Also Editions Le Lombard have no clue what the card was used for. 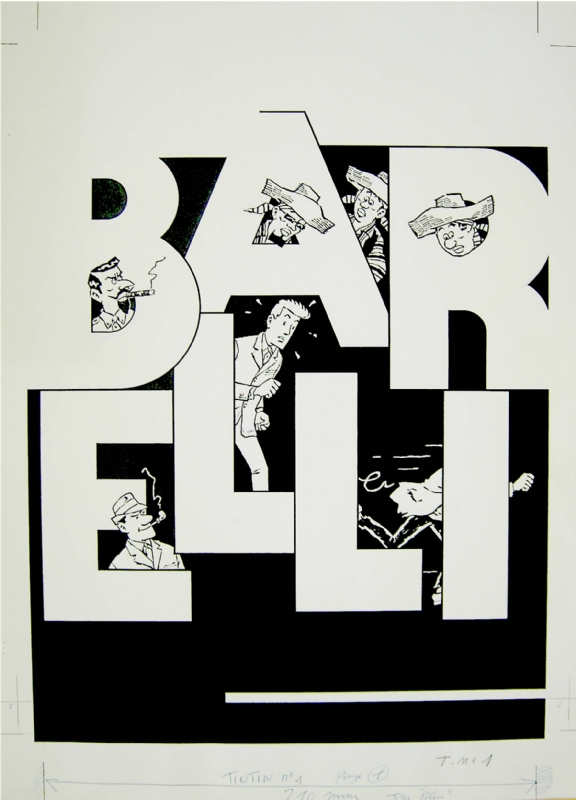 In 1987 the Lombard publishing house would release a postcard featuring Barelli, Anne Nannah and what seems to be 4 other colleagues in an office. On the back of the card we can see ‘Copyright by Lombard 1987 De Moor’ plus the phrase “Pour ta promotion, sincères félicitations”. The card comes from the archives of Olivier Marin. But that’s not the only reason why we present you this card today. We actually found back the counterpart (the sketch that is) in the archives of the family De Moor, which kinda gives you a very good idea what the early beginning of this postcard looks like. 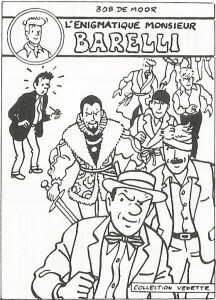 The final version as printed by Lombard in 1987. We tried to obtain some information on this postcard and especially for which particular occasion this postcard had been created or commissioned. 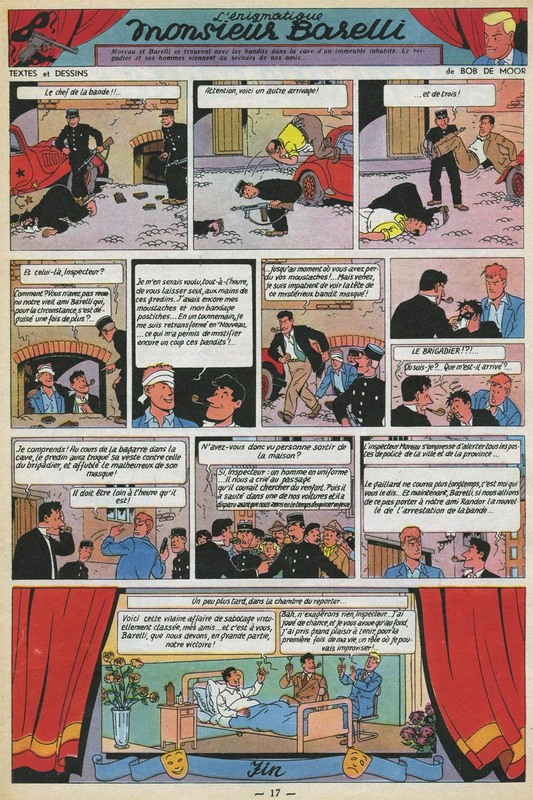 We talked to Yves Sente, who referred us to André-Paul Duchâteau (Belgian comics writer and mystery novelist who worked with Tibet on Ric Hochet). 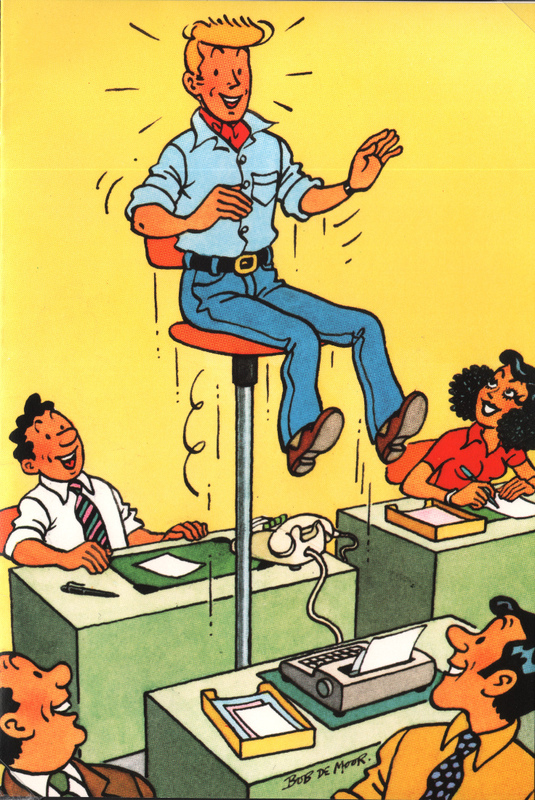 Unfortunately André-Paul Duchâteau couldn’t recall for what the postcard had originally been created but he thought that it could have been for the promotion of Bob De Moor himself that year as artistic director at Lombard. However, that only happened in 1989. It’s our guess that the card was used throughout the company, but if anyone knows a bit more on this, please contact us. 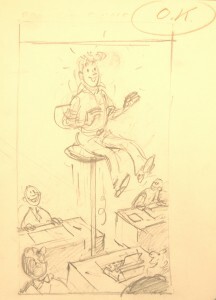 The sketch made by Bob De Moor. 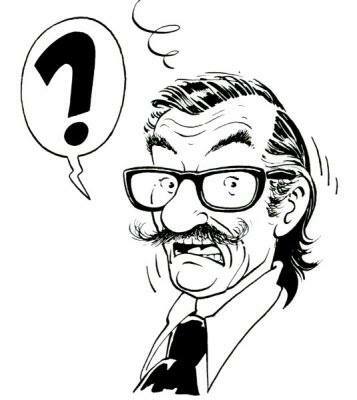 Let’s check the sketch Bob De Moor made. He didn’t change a lot compared to his first sketch (which was OK’d as you can in the upper left corner. The only difference is actually that Anne Nannah wasn’t in the first sketch or at least he had not yet chosen her to be the character on the right of Barelli. This is a nice example of what various archives can deliver. We’ll continue to match various archives to present your further examples. 12 years after he released his last Barelli story, the second part of “Monsieur Barelli à Nusa Penida”, in 1964 a brand new Barelli adventure would pop up in the Tintin Journal: “Barelli et les agents secrets” (French for “Barelli and the secret agents”). 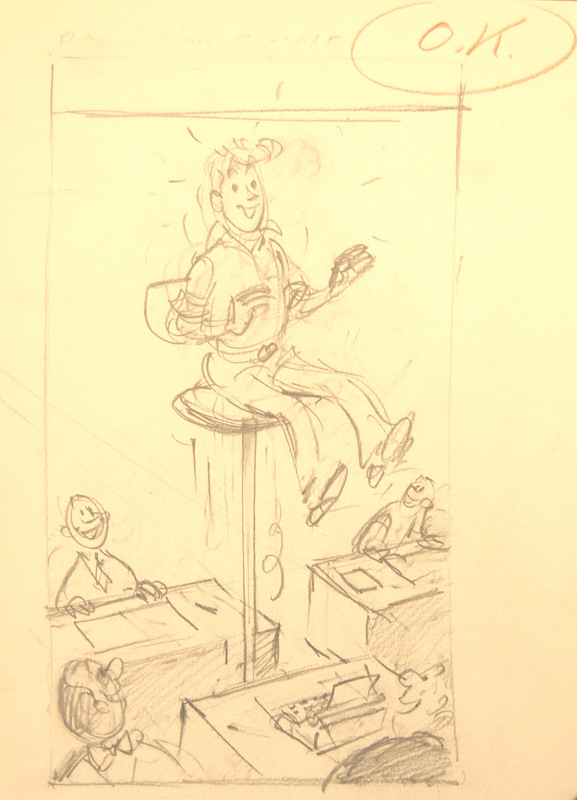 On the left we show you the original black and what drawing made for the Tintin journal cover. 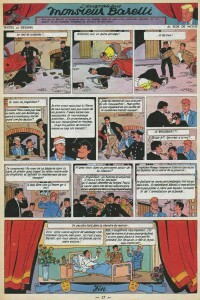 For this story Bob de Moor switched to a totally different way of drawing, away from the clear Hergé line. 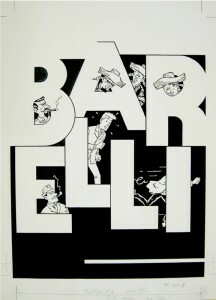 Although not amongst the favorites of many clear line fans, artistically it’s one of the best works he did in the Barelli series – for being completely different to start with – and scenario wise it really holds the road, he had written it out before and added enough twists to the story to keep the pace going. 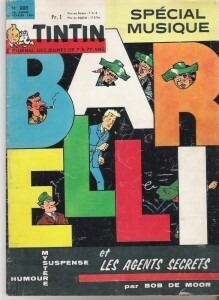 Although this 32 page story was released in 1964 in the Tintin journal it would only see an album release some 9 (!!) years later via Lombard. Luckily enough it’s now available again in a proper edition via BD Must. You will have noticed that the cover artwork used for the album edition was again in the clear line. 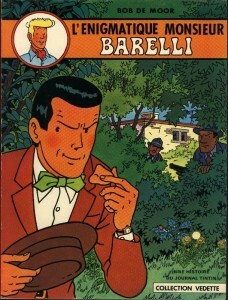 Too bad, because the cover de Moor created for Tintin is more in line with the rest of the album. 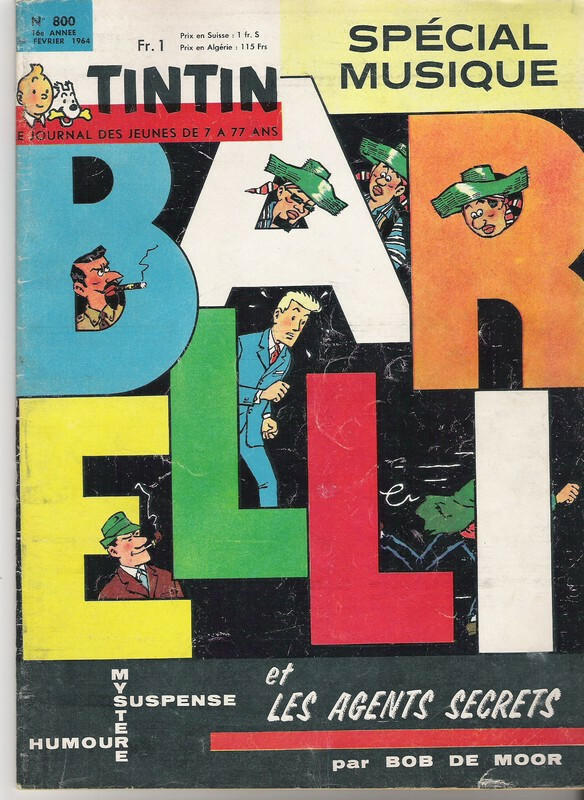 Note that band The Coconuts as featured in this album would make cameo appearances on several drawings afterwards, from publicity ones to even a plate in the last finished Tintin album “Les Picaros” (check page 54 and look at the band playing on the left of the red Picaros bus…).